Joy’s mother was a dressmaker and she learned to sew and knit, at her knee, at an early age and has always loved the feel and look of textiles. 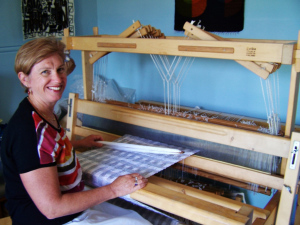 Joy has been weaving since 2004, having learned through the HandWeavers & Spinners Guild of NSW, from a great teacher, Elizabeth Calnan, who is also a member of the North Shore Craft Group, and she enjoys continually learning and improving her skills and ability to create new designs. She enjoys expressing her creativity through the beautiful textures and appearance of a variety of fibres and colourways and prefers working with natural fibres particularly silk, finely spun wool and bamboo because they feel luxurious and the cloth drapes well on the wearer. She also enjoys the mental challenge of designing and setting up the loom for each article and then the relaxing experience of the rhythmic weaving process. She gets great pleasure when others who wear her handwoven scarves, shawls & bags delight in their soft luxurious feel and appearance. She also enjoys working with different coloured and textured yarns and incorporates hand-dyed and hand-spun yarns to create uniquely crafted articles.